It is important to highlight that this year’s GCSE results cannot be compared to previous years due to the changes in the examination system. However, despite the more rigorous assessment procedures 51% of King Arthur’s students achieved above the national standard of 5 or more GCSEs including English and Mathematics at grades A*C or 9-4 with 54% gaining standards for Maths and English. King Arthur’s has a strong record of students progressing into further, higher level study and apprenticeships and is pleased that students will be able to access their chosen next steps. 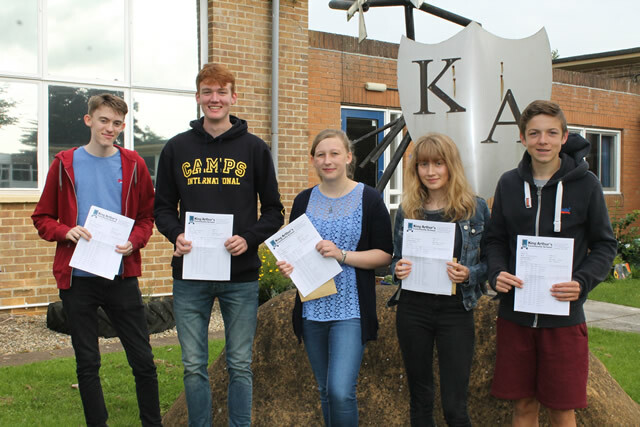 Particular recognition goes to Kelly England who achieved 10 passes including 6 A*, 2 A and grades 8,8,7; Danni Switzer who achieved 11 passes including 2A*, 4 A and grades 8,7,7; Caleb Maskell who achieved 10 passes including 6A, 1B, and grades 4,6,9; Mollie Chapman who achieved 10 passes including 1A*, 3A and grades 5,6,7; Josh Harrison who achieved 10 passes including 4A, 2B, and grades 6,7,8 and Georgina Isaacs who achieved 9 passes including 3A, 3B, and grades 5,7,9. Alongside the high academic performance of some students there are many stories of students who have achieved strong GCSE results despite significant adversity. We celebrate the successes and progress of all of our students and wish them well for their futures. "It was a great atmosphere at school today as students received their results knowing that so many of them were able to continue with their chosen course of study or work. In a context of change and increased rigour the staff and students should be proud of their many achievements."